Do you know you love French Country style, but are not quite sure how to recreate the look in your garden and home? 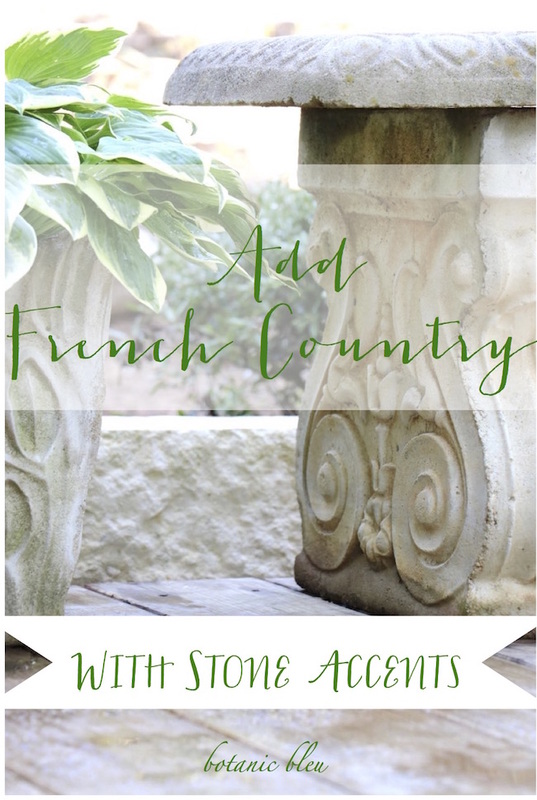 Are you looking for ways to add more French Country style to your garden? 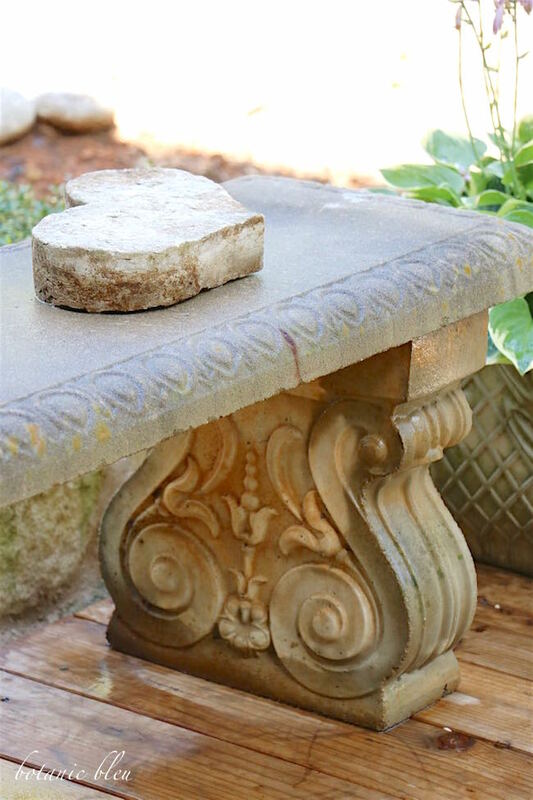 One of the major elements in French Country style is natural stone. Creamy stones are the most predominate building material for houses in Provence and along the French Mediterranean Sea coastline. Carved stone balcony railings are found throughout the country. Stone statues, water fountains, pathways, and walls appear in medieval cities, town squares, and private gardens across France. 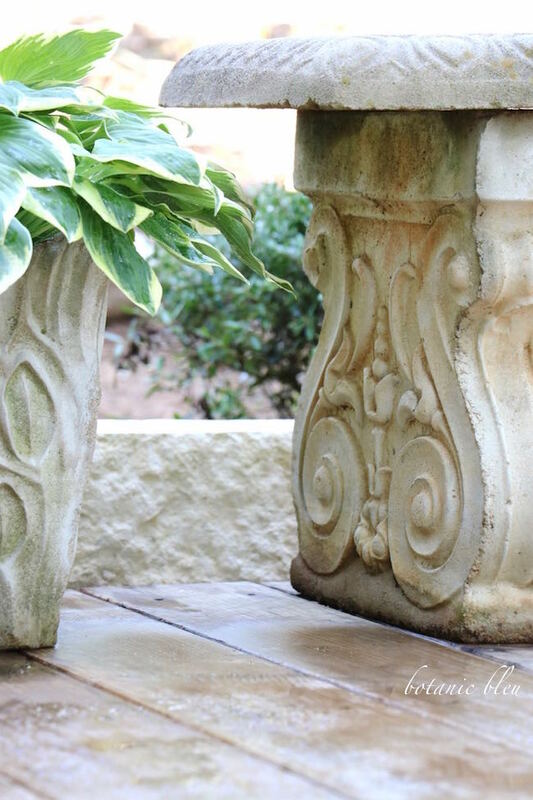 By using stone accents, you can add French Country style to modern houses and gardens. It only takes a few changes to create a definite French look. 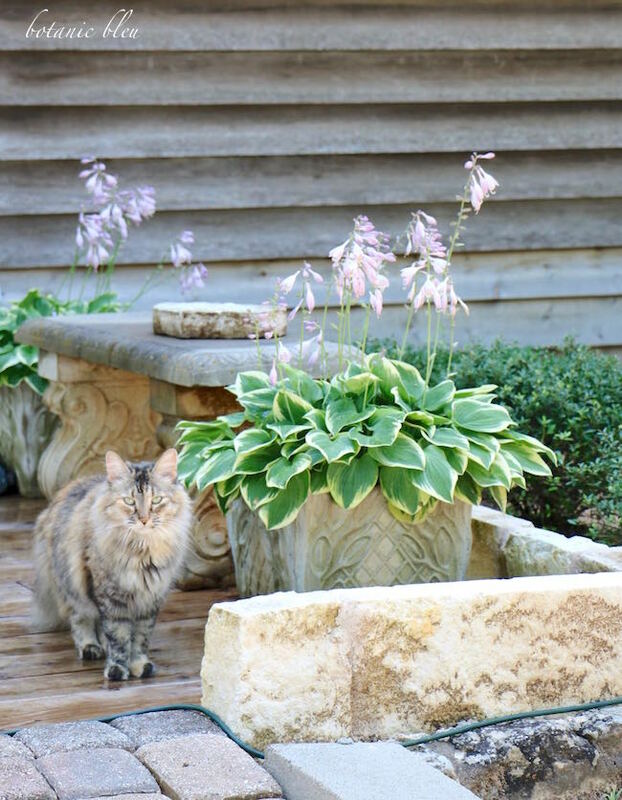 The stone planters with the hosta plants already existed for several years on my redwood deck. A short limestone wall also wrapped around one end, but was barely visible since it was at the same height as the deck. Adding a second layer of stones to the old short limestone wall not only redirects water around the deck, the wall now is more of an architectural feature. Here is how the deck looked BEFORE replacing the glass-topped iron table with an old existing concrete bench. Here is how the deck looks AFTER placing the concrete bench where the glass-topped iron table was standing. Same concrete planters with hosta plants, same stone perimeter wall, but with the concrete bench. The greenish mossy look on the stone wall was created by abundant rain this spring and adds to the old-world charm feel of the area. 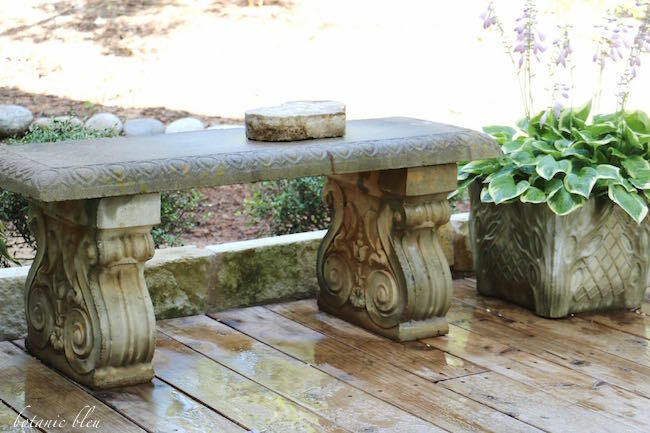 Have you noticed that the proportions of the low bench tie with the concrete planters and stone wall much better than the tall glass-topped iron table? What gives the bench a decided French Country look? The architectural details in the concrete bench supports and along the edge of the bench top reflect a French flair for curved details in their designs. Three new dwarf yaupon holly shrubs add to the French design by providing symmetry and shaped, rounded topiary patterns. 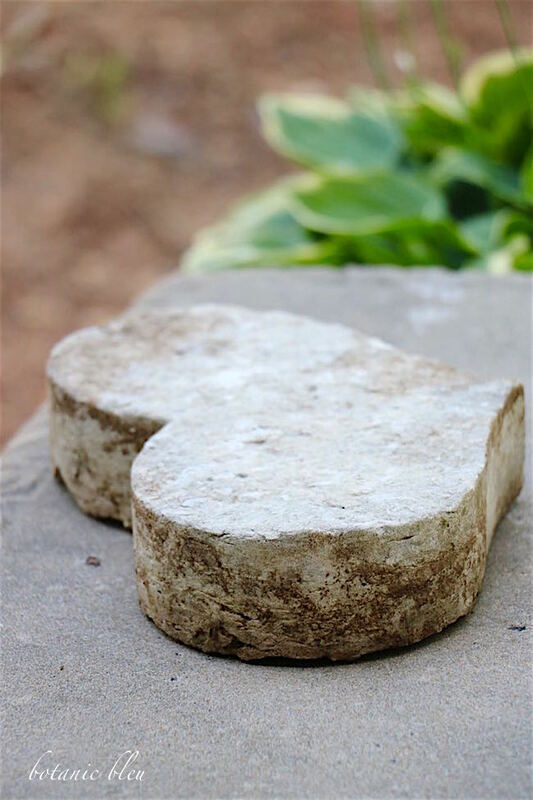 Perhaps not a design symbolic of France, the hand-carved limestone coeur (heart) nonetheless is a design renowned for symbolizing romance, which is symbolic of France. Stone accents with rustic details add a patina that suggests a connection with the past reminiscent of building stones in France that have had deep connections for centuries. Chateaux, fortresses, city walls, and humble maisons (houses) exude a worn patina from old stones. 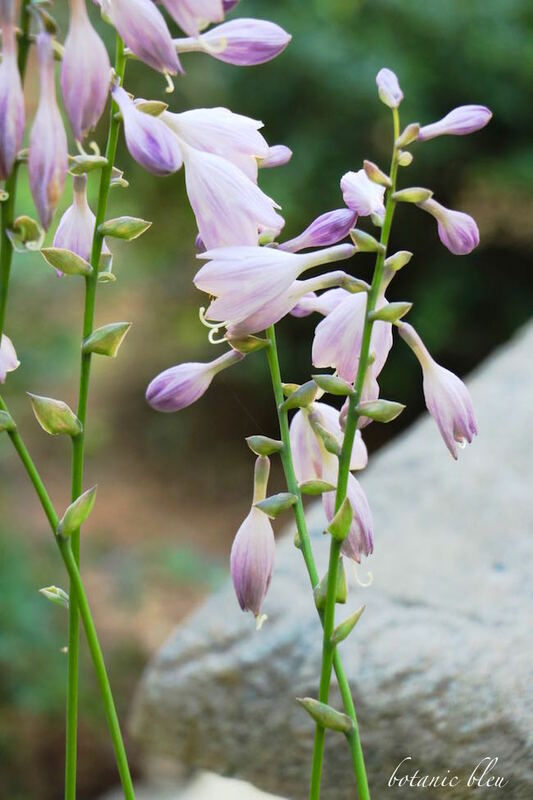 Delicate hosta blossoms softly swaying in the breeze add another layer to a French Country garden look. 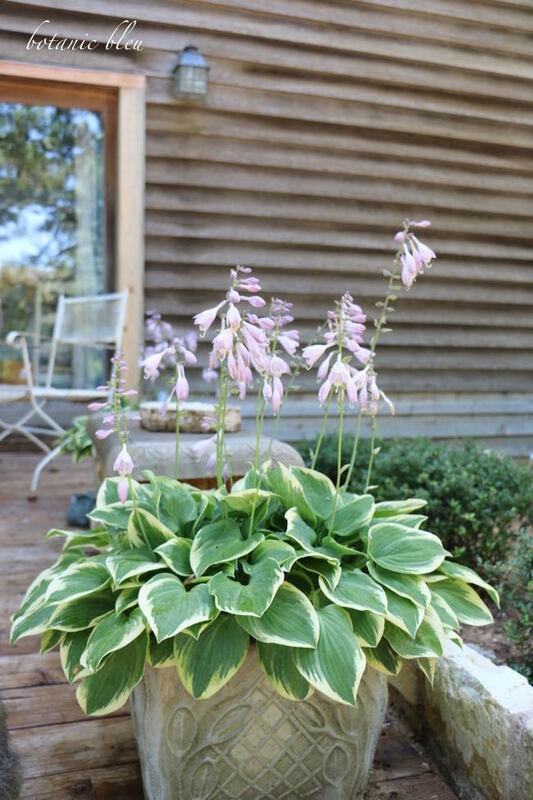 Hostas are on the list of plants at French Gardens to use in a French-style garden. Agapanthus are also on the list of plants to use in a French-style garden. 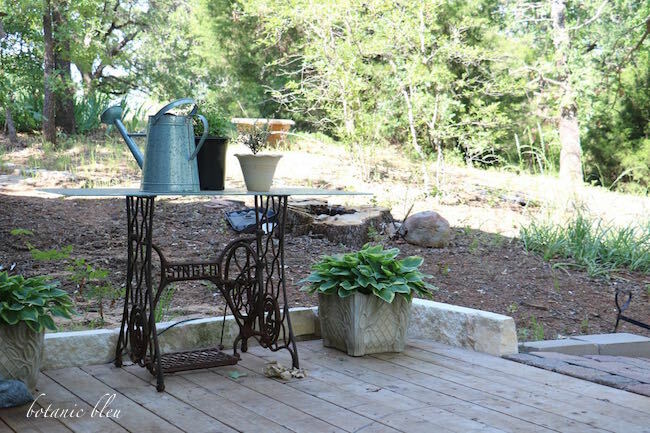 See Deck Update 1 - French Style for more ways that I include French Country style on my deck. What do you recommend to create a French Country garden? I agree with you here Judith, JE SUIS D'ACCORD AVEC VOUS! These natural elements (not plastic, not overly colorful) pieces are what give the authentic, time-worn, ancient feel of France. And that COEUR, where on earth did you get that?! Have fun in your French world. I am in mine! I love your bench in its new location. Now you just need to get a cool drink and sit down on it and enjoy your beautiful garden! Very pretty. I love stone accents. That heart is amazing. Love it. Another beautiful post, Judith. You have captured the feel of French Country style. Stone with the patina of time is what I think of for authentic French country. We have stone urns and fountains in our garden, and this spring I've added a French table with posts of topiaries. I would like to add espaliers to side walls in our garden. Enjoy your beautiful setting. Oh, and the heart is a wonderful piece! Those stone accents are fantastic and I love the look of the wood underneath, it's a wonderful combination. I've always loved stone, this goes back to my Italian upbringing, sometimes be very similar to the french. You've given me some neat ideas for our next move. I'm thinking incorporating a little more stone in our garden perhaps around the base of the raised beds as I build up with wood, that could work. Thanks for the inspiration! You're photos are fantastic and your outside space looks amazing. Your garden is a beautiful oasis. I have always loved earth elements - stone, rock, wood. Your beautiful home incorporates all of them. You all are giving me ideas for my own home. Very inspiring! 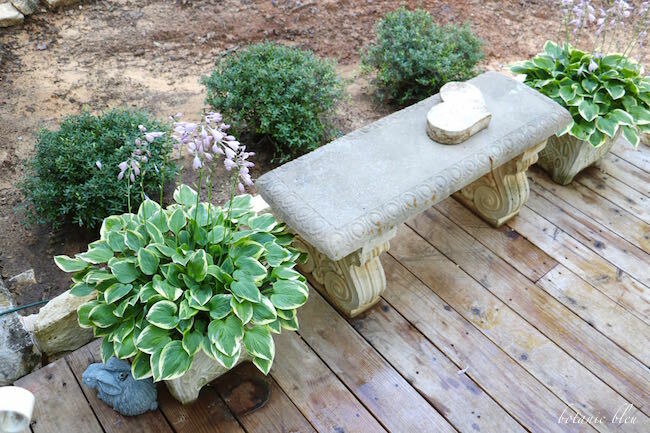 I'm partial to your stone benches as I have the same ones in my garden but the planters with beautiful blooming hostas set it off so well. Love the stone heart too. The garden looks lovely, Judith, and the bench does add a certain something to make it tres chic. Judith- these stone additions are lovely. They look like they have been there forever. I always enjoy your posts at Thoughts of Home. 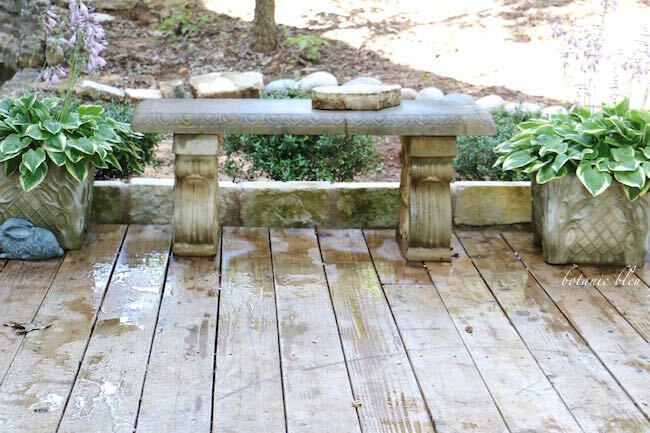 Your deck is lovely with these stone accents! It is always inviting to see stone or cast concrete in yard design. Thanks for sharing at Home Sweet Home! I will feature this today!